A Person Known to Me films on the streets of Port Townsend. Picturesque Port Townsend, Washington, located on the peninsula between the Cascades and the Olympics, has been home to many productions over the last several years. 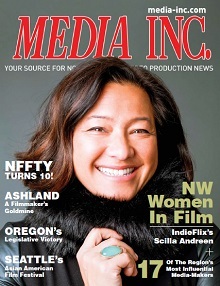 Indeed, everything from Hollywood features (Snow Falling on Cedars, The Ring) to commercials (Washington State Lottery) to indie films (A Person Known to Me, You Can’t Win) have utilized Port Townsend as a backdrop for their productions. Christina Pivarnik, marketing director for the City of Port Townsend and the city’s film liaison, says this is because of the wide diversity of filming locations that the town has to offer. Pivarnik also mentions the vast filming locations within Fort Worden State Park, a military fort built in 1902, where An Officer and a Gentleman was filmed. “(Fort Worden) offers numerous sets, from Victorian officer’s quarters to three-story barracks, dark tunnels, gun emplacements, an abandoned labyrinth of concrete bunkers and classic, red-roofed lighthouse with volcanic Mt. Baker in the background,” she adds. Several memorable scenes from the 1982 film were shot here, including Richard Gere’s famous line, “I got nowhere else to go!”, which was filmed on the southwest corner of the upper level of Battery Kinzie. Other Fort Worden locations included the interior of the USO building (used for the reception scene near the beginning of the film), Building 204 (used as the dormitory and its porch was used for the film’s closing ‘silver dollar’ scene), and the blimp hangar (used for the famous fight scene between Gere and Louis Gossett Jr.). In addition to a vast array of unique filming locations, Pivarnik says the town is extremely film-friendly and accommodating of film production. For more information about filming in Port Townsend, visit www.EnjoyPT.com.